The SWERUS-C3 (Oden) expedition continues to update methane findings of the past several days. The ship's current location is in the Laptev Sea, searching for methane plumes and rechecking stations visited in past expeditions by Semiletov and Shakhova. The circled area on the map is the area of the methane emissions addressed below. Use Google Chrome for website. What is being found is surprising and sobering. As Ulf Hedman, Science Coordinator, Swedish Polar Research Secretariat reported yesterday, they have found at least one "megaflare" of methane release from the Laptev Sea floor into the armosphere. In his words, "We are “sniffing” methane. We see the bubbles on video from the camera mounted on the CTD or the Multicorer. All analysis tells the signs. We are in a Mega flare. We see it in the water column we read it above the surface an we follow it up high into the sky with radars and lasers. We see it mixed in the air and carried away with the winds. Methane in the air." Örjan Gustafsson, Stockholm University, commented, "The discovery was made while the icebreaker Oden crosscut the Laptev Sea along a depth gradient from 1000m to just 100m following the continental slope upward to reach the shallow waters of the outer Laptev Sea Shelf. By use of acoustic techniques and geochemical analyses of water samples, the scientists found vast methane plumes escaping from the seafloor at depths between 500 m and 150 m. At several places, the methane “bubbles“ even rose to the ocean surface." 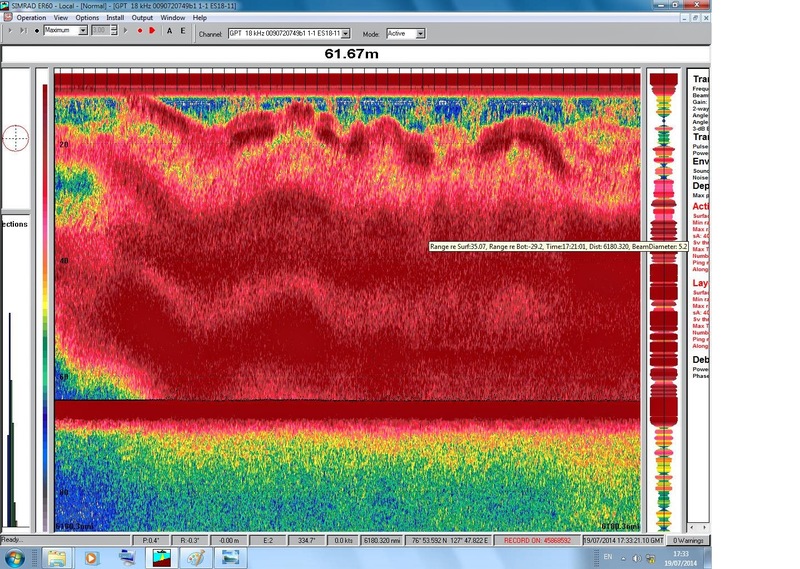 Hedman posted this image to illustrate the rise of, and the saturation of methane in the ocean at one location which seems to be at about 62 meters in depth. Hedman's comments about this search and discovery were: "Back and forth, back and forth. We are now on the way to station 22. Back and forth. Indications of flares and the mid-water sonar goes red. We throw everything we got in the water and turn on all ship system to maximum for logging data." So what are the initial findings? According to Örjan Gustafsson, Stockholm University, "the leaking methane from the seafloor of the continental slope may have its origins in collapsing “methane hydrates,” clusters of methane trapped in frozen water due to high pressure and low temperature." The methane saturation levels were the big surprise, "results of preliminary analyses of seawater samples pointed towards levels of dissolved methane 10-50 times higher than background levels." What is causing the seeps to increase? That subsurface Atlantic water is accompanied by Laptev Sea surface temperatures as high as 6.9 C, as reported by Oden over the last few days. How large an area of methane release is witnessed by the expedition? Enough that it is a significant source emitting from several areas in the megaflare. "We mapped out an area of several kilometers where bubbles were filling the water column at depths of 200 to 500 m,” writes Örjan Gustafsson. "Additional observations include the discovery of over 100 new methane seep sites in the shallower waters of the Laptev shelf (at 60-70m depth), a likely consequence of the thawing subsea permafrost." We have gained solid science data on a major methane source that is entering the atmosphere form the Laptev, and it will be interesting to observe how many more will be found in the coming days. If this is further documented, we are witnessing the further degradation of subsea permafrost with real global climate implications. Those flares did reach the surface as evidenced in the high methane concentrations in the Svalbard area during that period.